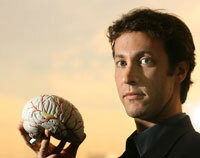 DAVID M. EAGLEMAN is director of Baylor College of Medicine's Laboratory for Perception and Action, whose long-range goal is to understand the neural mechanisms of time perception. He also directs BCM's Initiative on Law, Brains, and Behavior, which seeks to determine how new discoveries in neuroscience will change our laws and criminal justice system. He is the author of Sum: Forty Tales from the Afterlives, and Wednesday is Indigo Blue: Discovering the Brain of Synesthesia. While this is a normally adaptive mechanism, we have discovered a strange consequence of it: Imagine that every time you press a key, you cause a brief flash of light. Now imagine we sneakily inject a tiny delay (say, two hundred milliseconds) between your key-press and the subsequent flash. You may not even be aware of the small, extra delay. However, if we suddenly remove the delay, you will now believe that the flash occurredbefore your key-press, an illusory reversal of action and sensation. Your brain tells you this, of course, because it has adjusted to the timing of the delay. 1 V. Pariyadath and D. M. Eagleman, "The Effect of Predictability on Subjective Duration,"PLoS ONE (2007). 3 We introduced the term postdiction in 2000 to describe the brain's act of collecting information well after an event and then settling on a perception (D. M. Eagleman and T. J. Sejnowski, "Motion Integration and Postdiction in Visual Awareness," Science287(2000):2036–8).